Right job for the right price! Stone damaged windshield repair is the environmentally-friendly option for the High Country! Thousands of windshields get thrown in the dumpster every year because they cannot be recycled. Fix any stone dings on your windshield before they spread into cracks, thereby giving long life to your windshield. We can repair bullseye, star and combination chips in about 30-45 minutes and your are able to drive your car right away. Dont Replace it! Repair it! save Money $$!! Windshield repair will save you money. 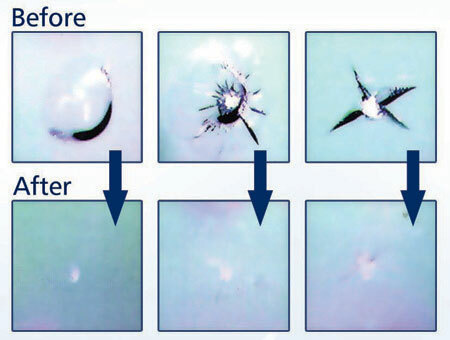 Stone damage or cracked windshields repaired at a fraction of the replacement cost. FREE - Insurance companies will waive your deductable and pay for entire cost of repair in full. Mobile Service - We come to your home or business at no extra charge. No further breakage - Strength and optical clarity perminantly restored. We work on almost all makes and models of vehicles, we use only OEM products. Please fill out our work request form to request an auto glass appointment.